Somehow it's almost the end of October. Halloween is just a few days away, and Thanksgiving just a few weeks away. (It's early this year -- the 22nd!) Fortunately, though we had a cold spell in Atlanta, the weather is warming up again, and we'll see temperatures in the 70s again this week. Hooray! It's much easier to wear dresses when it's nice outside. October is also Breast Cancer Awareness Month, so I'm getting in my hint of pink while I still can. I've scheduled my first mammogram for next month; I turned 40 this year, so it's time. I know several breast cancer survivors, but no one actually related to me has ever developed the disease. That's NO EXCUSE for putting off a mammogram, though. They are so important for early detection. Bloomingdale's has the dress in two prints: white with pastel flowers and navy with a larger rose print. I find this silhouette so flattering that I actually have it in two versions. The other features a black and rose print that I wore when I visited my sister in Chicago a few years ago, when her son was first born. I haven't actually featured it on the blog, though. Oops! Stay tuned. Is a fashion designer the modern era's version of a magician? Maybe. The industry is known for crafting clothing and footwear to make you look thinner and taller, to hide flaws and accentuate assets. Take today's outfit. I'm actually wearing a dress with an "illusion" neckline, and pumps designed with partly clear straps to make the legs look longer. You can still buy the dress on RueLaLa.com and Bluefly, which have the same owner and thus the same inventory and pricing. I also found this similar Shoshanna dress on Amazon, and a chic LBD (also with an illusion neckline) on Bluefly. The dress is just beautiful, and in person you can see the sparkle in each thread and the clear amount of detail that went into embroidering every flower, butterfly and golden petal. It's probably a bit fancy for the office, but I wanted to wear it! I have seen these sandals on almost every Hollywood A-list star, from Jennifer Lopez to Gigi Hadid. The sandals retail for $395, but I decided to treat myself this month when People offered $100 off any order on the Tamara Mellon website. You can still get the discount through the end of this month (October 2018); just add the code PEOPLE100 at checkout. Tamara Mellon co-founded Jimmy Choo in the 90s, and the Frontline Sandal has really boosted brand awareness. The clear straps on the sides are designed to make the legs look longer; do you think they do the trick? I'm not new to the brand. I have one other pair of sandals from Tamara Mellon that I bought several years ago. Overall, I'm really happy with today's look. Fashion may weave a sort of magic in today's world, but there's no illusion about feeling beautiful. Most of the clothing I showcase on this blog is in the form of a dress, but every so often I throw in something different -- like a jumpsuit. I love a good wide leg jumpsuit. It feels so freeing to wear something that isn't glued to my body, and I like the jumpsuit because it seems made for the office... It's like wearing a chic form of a power suit. One tip to keep in mind when shopping for a jumpsuit: make sure it's easy to get on and off. I have one jumpsuit in my closet that I can't wear to the office, because it has so many buttons in back, there's no way I could get out of it to go to the bathroom. You'd think designers would keep that in mind when working on their creations! Sheesh! You can still buy the jumpsuit on the Trina Turk website, but even with my good Google sleuthing, I couldn't find the jumpsuit on any other shopping site. If you like today's look, however, check out these other wide leg jumpsuits, all in a similar style -- and all from the Trina Turk brand! I've had these sandals for years, and I still love them! These Stuart Weitzman sandals are also my tallest sandals, so I often wear them with maxi dresses and jumpsuits. Even after getting the length altered, I still feel so short! Today I'm wearing my first dress from the Eliza J brand. It finally feels like Fall here in Atlanta, so I thought it was the perfect opportunity to bring out this long-sleeve dress! 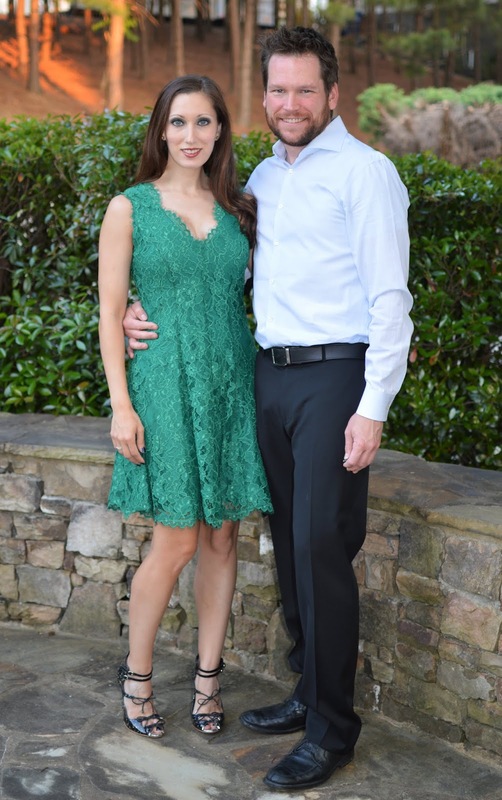 The dress is available at Nordstrom in the same black and white color scheme I'm wearing, or at Dillards in a beautiful Aubergine color (select sizes only). You can also check out this similar design on Amazon. Nordstrom Rack has a wide selection of Eliza J dresses as well, many with the bell sleeve design, and all available at great prices. I was so happy to see that Eliza J also sells dresses in petite and plus sizes. If you like the brand, you should be able to find something that perfectly fits your body. That's kind of rare these days. I'm wearing a size four, but probably should have sized down; the dress seems to run a little big. I really debated what shoe to wear with this dress, since I had so many options. You could go with black/white, red or really any color of the rainbow. I finally settled on these Kate Spade pumps since I had not worn them in quite awhile, and I like the way they complement the overall design aesthetic. What do you think? Did I choose wisely? Today also marks two weeks since I have started on a low carb diet, and I have to say -- I miss my processed foods! Cereal, crackers, Halo Top... Chapin is taking bets on how long I last. Ha! I miss all my sweets, too, although I am loving this low-carb brownie that mixes up in just a few minutes. Definitely share your favorite low-carb recipes in the comments. Today's dress is one I found while shopping at Anthropologie with my mom and sister last month. It's a super cute dress, and extremely comfortable, and has just been marked down even further online! It's now only $50! The material is a little heavy, so it's absolutely perfect for fall in Atlanta. Since it's black and white, you can add any color jacket when it's chilly outside. This picture today also marks the first time I've been photographed with my "new eyebrows." The color is still coming in, so I am filling in the gaps with makeup now that my ten days have passed. I may need to go darker with the color next time. What do you think? Do they look natural? The skin is still a little tender, but overall, I'm so happy. I know I'm still early on in the process, too, so things are only going to get better. I also want to add that it's been really nice to share my microblading experience and get so much positive feedback. Just a few people knew I was getting the procedure done beforehand, and everyone was so wonderfully supportive and encouraging. Thank you! 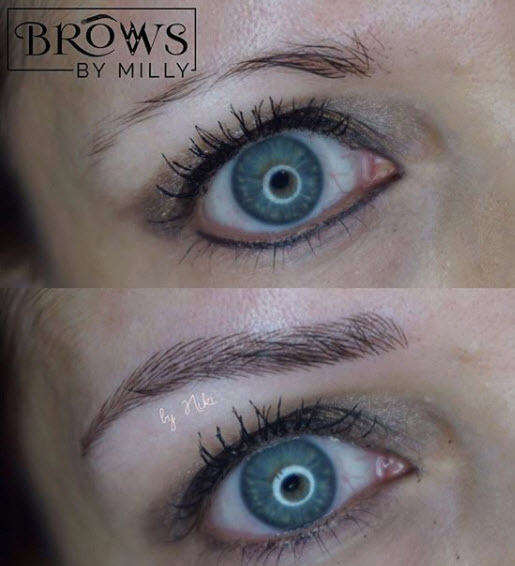 I recently went to Brows by Milly in Atlanta for eyebrow microblading, and I wanted to share my experience and advice about the whole process. It actually took a very blunt friend of mine saying that I absolutely "had to do something about my eyebrows" for me to realize that my thinning eyebrows weren't just something I was noticing -- other people were noticing the issue, too. Read below to learn more about how I decided microblading was for me, and my overall experience with Brows by Milly in Atlanta. My eyebrows have long been an issue for me. During the 90s and early 2000s, I was committed to waxing and tweezing my eyebrows into thin strands that rested in perfect lines above my eyes. That look quickly went out of fashion, and by the time I was saying 'I do' to Chapin in 2003, I was desperately trying to grow my eyebrows out -- and having limited success. I was only 25 years old. My mom struggles with thinning eyebrows, as do other female members of my family, so I'm thinking maybe it's a hereditary issue stemming from my (mostly) Italian roots. Despite trying to grow them out, my eyebrows remained thin... and just kept getting thinner as I got older. 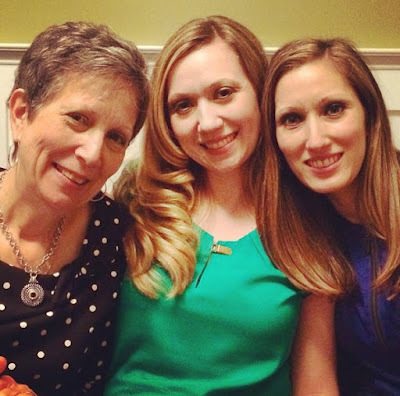 (From left) My mom, middle sister and me - May 2014 - Age 36. I have always loved makeup, but I guess because when I was learning to apply makeup I didn't really pay much attention to my brows, I didn't buy my first brow tool until I was well entrenched in my 30s. I just never really thought about it. Keeping up this blog, and taking daily pictures of myself, helped me see myself in a new light. Around 2014, I realized that from far away, it looked like I didn't have any eyebrows at all, and up close, you could barely see them. I knew I had to try something to get them to grow. May 2015 - Age 37 - This picture highlights my sparse brows at the time. From coconut oil to castor oil, wands and serums promising to help grow my strands, changing my diet... nothing worked. NOTHING WORKED! My eyebrows remained as thin as ever. That's when I started trying to get creative with my makeup. From far away, it looked... okay. Up close, though, I felt like my eyebrows were drawn on, and it morphed into an issue I was starting to feel really self-conscious about. Even when I would run a 5K or see people out and about in more of a "make-up free" setting, I still would not leave the house without some kind of makeup on my sparse brows. I don't even want to add up the cost of all those products! And while I thought I was doing a decent job filling them in... obviously I wasn't. That's when I started looking into microblading. Many people don't even know that microblading exists, as it is relatively new to the beauty scene. Basically, microblading is a series of semi-permanent tattoos that mimic the look of eyebrow hair. They are not permanent -- the marks don't go as deep into the skin's layers as they do when getting a permanent tattoo -- but they will still last up to one year. Most beauty magazine and bloggers have covered microblading in some form or another, so when I started my research, there was plenty to read and understand. You can't let the research scare you out of having microblading -- like most things, there are a few horror stories out there -- but you also can't be ignorant of the risks. Microblading is a committment, so you have to really want thicker eyebrows. If that's the case, you have to go to the RIGHT place with the RIGHT technician. Microblading is, at its core, an art form, so don't just go anywhere. Be confident with your decision to get microblading, then be confident once you choose the right place for the procedure. First, you have to decide if microblading is really the right option for you. If you feel self-conscious about your brows like I did, I say go for it. But the decision has to be yours and yours alone. Don't let anyone else talk you into (or out) of it. I had a lot of microblading options here in Atlanta. I narrowed it down to two places -- one I found on my own and one that my dermatologist recommended. You may want to even ask friends for recommendations, maybe even put something out on Facebook. Most likely someone you know has had this procedure! Whatever the case, once you've done your research, just focus on a few places so you can really feel confident in your decision about where to go. Most places will offer a consultation, but it's not mandatory. Even though I had to pay for my consultation at Brows by Milly, I'm glad that I did. I asked a lot of questions, felt more at ease about what I would be signing up for, and viewed the location in person. I'm not sure I would have just signed up for microblading without taking that first step. One of the biggest reasons I decided to go with Brows by Milly was the reviews. I couldn't find anyone who had a bad experience there. I would have to drive almost 50 minutes to get there, but I didn't care -- I felt confident I was going to the right place. I was concerned that my brows, being so sparse, wouldn't look natural with microblading. I found several Before and After photos showing women with similar looking brows, and the After photos always amazed me. Yes, I know that photos can be Photoshopped and altered, so I looked for videos, too. 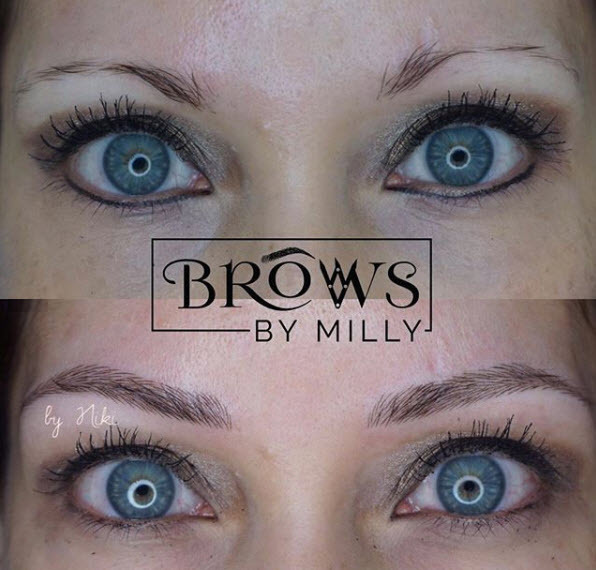 The Brows by Milly Instagram page had so many photos, it was easy to see the team there knows what they're doing! A little... definitely not as much as I thought. I have sensitive skin, and an especially sensitive brow area -- I constantly sneezed when I used to pluck by brows -- so I was expecting some intense pain and discomfort. But I sneezed just once and generally found the pain to be very tolerable. After the first ten minutes, they put some numbing cream on, and once that happens, it's smooth sailing. My eyes did water constantly, though! Did You Wear Makeup the Day of the Procedure? Yes. I had an afternoon appointment, so I worked in the morning and was in full makeup when I arrived. They will sanitize the area they are working with, so don't worry about that! My brows are by Niki Marques, the sister to the famous Milly. She did an amazing job and really put me at ease when she saw how nervous I was on the day of the procedure! After the procedure, you basically can't get your eyebrows wet for 10 days. No sweating or wetting! That has maybe been the hardest part of this whole experience. I can't take a shower like normal and I can't run or workout. Ugh! What Do Your Brows Look Like Now? Here are my brows on Day 8, and they still look wonderful. At this point, I hadn't experienced any scabbing or peeling! Note: I'm not wearing any eyebrow makeup -- you actually can't for the first ten days! Most people haven't even noticed; they just think I have natural, beautiful brows! How Often Do You Have to Get Microblading Done? In about a month, I will go back for a touch-up, and then I just need to go yearly to keep up the work. I will definitely be doing that. Microblading is not cheap, especially if you go to a reputable place. You should budget about $650 for everything, from the consultation to the main appointment to the touch-up. The cost will go down for regular appointments, but you can expect about $450 per year. To me, it's worth that for the peace of mind and confidence I feel right now. And if I don't want to keep it up, all I have to do is stop going, and the color will fade from my brows. Now all I'm asking is... why didn't I do this sooner? I know today's dress is a bit fancy for work, but I just recently purchased this dress from Rue La La, and couldn't wait to wear it! Isn't it gorgeous? It looks more like a party dress, but when you work as much as I do, you have to make everyday a party... right? The dress is still available for purchase at Net-a-Porter and BlueFly, and I also found it on eBay. If you like the Alice + Olivia brand -- it's one of my favorites -- I also have to mention the site is doing its annual Friends and Family sale this week, so everything (including sale items) is 25% off! This exact style is no longer available, but the Romy shoe comes in a variety of colors and prints.